Recently I went shopping at Ulta. This is my haul from there with mini-reviews. Maybelline The City Mini Palette in Downtown Sunrise – This eyeshadow was a little bit difficult to work with because the shadow came onto the brush very chunky, but it had nice pigmentation and I really loved the coral shade to make a nice warm look that I smoked up with the brown and the highlighter shades, and all the rest of the shades worked well as well. It gets a B+ from me. 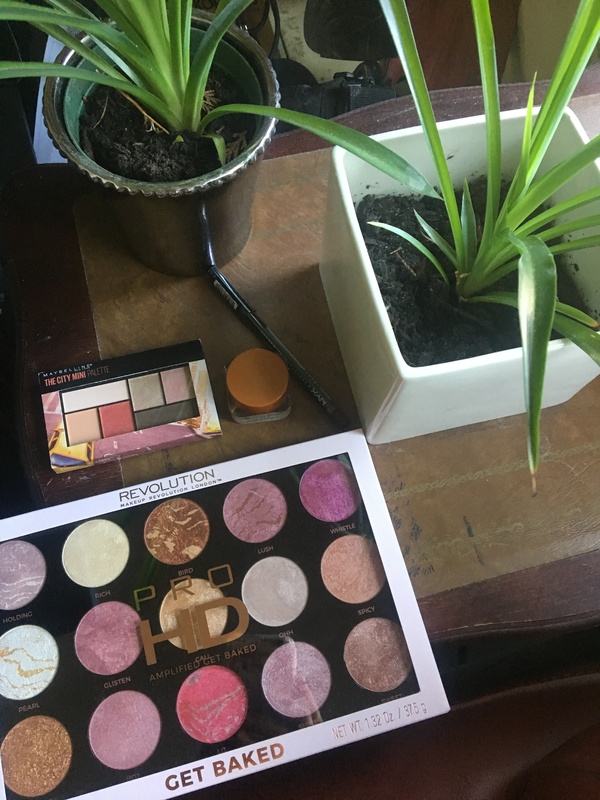 Makeup Revolution Pro HD Amplified Get Baked Palette – This palette was a little bit disappointing for me because it wasn’t as pigmented as I would like, though if I went in with several of the shades at a time or used them wet they gave a nice subtle glow or blush color. I’m not sure if I would re-purchase this but it was decently nice (although the palette is HUGE so it made finding a place to store it a little bit difficult, and it’s not something I’d recommend for travelling. Tree Hut Sugarlips Lip Scrub – I loved this lip scrub! It was super moisturizing and had a balm-like texture with tons of sugar scrub bits to fully exfoliate all the dead skin off on my lips and leave them super soft and plump. NYX Faux Black Eyeliner in Oxblood – This was a nice deep red color that I used with the Maybelline palette for a smoky red look. I used it on the lower lash line smudged out with a brown eyeshadow and it was very pigmented, creamy, and easy to work with and lasted well throughout the day. Makeup Revolution Luxury Baking Powder Banana – This banana powder is definitely a new favorite for me! It made my under-eyes super smooth and brightened, and is definitely my new go-to for setting my under eye area. Loreal Brow Definer in Light Brunette – I have gone back to this brow pencil again and again and I re-purchased because I ran out of my previous one. As I’ve said before it’s a great dupe for the Anastasia Brow Wiz as it’s super thin, and goes on very easily and lasts all day. It’s very easy to achieve a great defined brow with this pencil, and I’ll continue to re-purchase. Morphe M124 Firm Shadow Brush – This brush was a little small for putting color all over the lids, but it was firm and did a great job of putting shadow to specific areas. So far I’ve actually been pretty impressed with the quality of the Morphe products I’ve tried and this one did not disappoint either. Makeup Revolution Pearl Lights Loose Highlighter in True Gold and Peach Champagne – These highlighters are nice and very glowy, especially when used wet. I tend to like to were these highlighters like most highlighters which is over a cream or liquid highlighter and applied wet. They’re also a little messier to use than regular powder highlight because they’re loose highlighters, but they look beautiful. Makeup Revolution Fast Base Stick Foundation in F8 – This foundation I liked more when I first put it on as it appeared very full-coverage and creamy. Them throughout the day I noticed patches wearing off faster than usual and it looking caky where it wasn’t fading. Would not recommend. Wet ‘n Wild Comfort Zone Palette – I liked the shades in this palette because they were very pigmented, just like my other Wet ‘n Wild palette I have from them (and they’re only $5.99 ao they’re dead inexpensive.) I did notice that the blue duo-chrome shade went on a little muddy when I applied it wet and it took some work to make it appear pretty. I did enjoy the more brown and neutral shades though. Warning: Don’t drop these palettes as I’ve experienced before that the packaging isn’t the greatest and very prone to breaking. thanks for review! been wondering about some of these products! No problem! Glad to be of help. Thanks for reading!